Objective: To present a case of multiple myeloma who developed osteonecrosis as one of the complications of bisphosphonate therapy. Case Summary: This is a case of a 59 year-old female was seen due to pain and purulentdischarge on the right mandible. Patient is a diagnosed case of multiple myeloma three years prior to admission who was treated with melphalan, prednisone, zolendronic acid, and has undergone radiotherapy for 25 sessions. 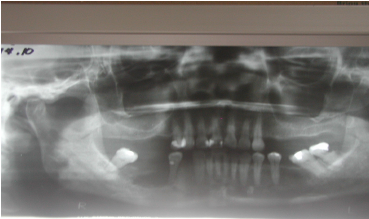 Panoramic radiograph of the mandibles showed radioluscency at the body of mandible suggestive of an osteonecrotic process. After discovering this, zolendronic acid was discontinued and sequestrectomy and hyperbaric oxygen was done as advised by the maxillofacial surgeon. Multiple myeloma is a hematologic malignancy characterized by the clonal expansion of malignant plasma cells within the bone marrow. Plasma cells are antibody-(immunoglobulin-) producing cells. When these cells grow out of control, they crowd out normal blood forming cells which eventually invades the osseous system. Myeloma-related lytic bony disease is now understood to be secondary to increased osteoclastic activity and impaired osteoblastic activity. This case report describes one of the complications of bisphosphonates in a multiple myeloma patient who has shown to be compliant to chemotherapy, radiotherapy and supportive care. This is a case of a 59 year-old female who was diagnosed to have multiple myeloma three years prior to admission. Her initial presentation was a persistent low back pain,which on further diagnostic workup revealed her condition. She was thereby advised to have radiation therapy and was placed on oral chemotherapy with melphalan and prednisone. Two years prior to admission, after seven sessions of radiotherapy, patient complained of headache, characterized as throbbing at the left temporo-parietal area, associated with pain and blurring of vision of the left eye. Her blood pressure was 140/90 mmHg. Cranial CT scan was done, which showed bony lytic changes in the base of the skull and an opacified left sphenoid sinus compatible with sinusitis. She was treated for sinusitis and was given antibiotics. She was also started on monthly intravenous zolendronic acid. She was discharged improved. The patient was maintained on melphalan, dexamethasone (six months) andzolendronic acid (one year). One year prior to admission, patient complained of pain of the right jaw initially mistaken for dental caries. However, there was noted progression of swelling and purulent dishcharge on the right body of the mandible. The patient sought consult with a maxillofacial surgeon to which a panoramic and periapicalxray were done that revealed a radioluscent area, approximately 2.5 x 3.5 cm with no clear border, periapical to tooth 45 extending to the posterior area at medial aspect of the roots of tooth 67 (Figure 1). 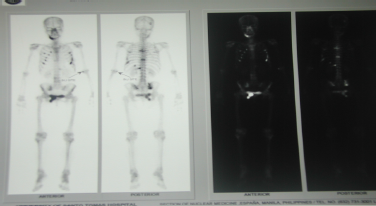 Bone scintigraphy was also done which showed multiple activity of widespread osseous metastasis and increased bone turn over in the body and ramus of the manbible(Figure 2). All the radiographic data and clinical presentation described are compatible to osteonecrosis of the bone Stage II (based from Table I) attributed to be secondary to bisphosphonates. Hyperbaric oxygen therapy, antibiotic prophylaxis and sequestrectomy was done. Histopathology showed diffuse coagulative necrosis which is compatible with osteonecrosis. The monthly treatment of intravenous zolendronic acid was resumed after three weeks. The author wishes to thank Vladimir Siangho, MD, Physician and Medical Writer for editing and proofreading the text and figures. 1. Tozi, Patrizia, et.al. Osteonecrosis of the jaws in newly diagnosed multiple myeloma patients treated with zoledronic acid and thalidomide-dexamethasone. Blood,Vol. 108, No.12.pp. 3951-3952. December 1, 2006. 5. Mehrotra,Bhoomi & Salvator Ruggiero. Bisphosphonate Complications Including Osteonecrosis of the Jaw. American Society of Hematology.pp 356-360. 2006. 7. David, Leslie et.al. Hyperbaric Oxygen Therapy and MandibularOsteoradionecrosis: A Retrospective Study and Analysis of Treatment Outcomes. Journal of the Canadian Dental Association Vol. 67, No. 7.pp 384-390. July/August 2001. 8. Smith, Alla, et.al. Oral Osteonecrosis Associated with the Use of Zoledronic Acid: First Case of a Patient with Advanced Pancreatic Cancer and Bone Metastases. Journal of the Pancreas. Vol 10 No 2. pp. 212-214. March 9, 2009.